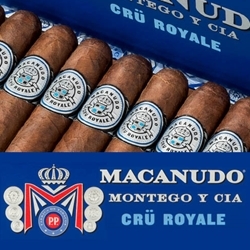 For years, the Macanudo premium cigar brand were made with only mild Connecticut wrappers until the Cru Royal line was introduced. These hand-rolled premium cigars were the creation of legendary cigar maker Benji Menendez who crafted a core of Nicaraguan & Dominican Viso long fillers together with Brazilian Mata Fina tobaccos then joining them up with a Dominican La Vega Especiale binder. All of this perfection is bound up perfectly with a beautifully aged dark, oily Ecuadorian Habano leaf wrapper. This combination produces an abundance of flavors of earth sprinkled with essence of pepper while still keeping that smooth flavor profile Macanudo is famous for. Macanudo Cru Royale has been named one of the Top 25 Cigars of the Year, earning a 91-rating. Try one of the varieties of sizes and flavors listed below. Each of these styles are available today for a discount price! Call us for more details!